When you're young, "You don't know what you don't know." That is a quote from my friend Jill, but it reminds me of my youth and, of course, food. In the school cafeteria, they served something called chicken chow mein, a gelatinous slop that I referred to as "chicken Jell-O." Did I mention it was disgusting? I don't believe anyone Chinese would serve something like this. Oh, I know there is a real dish of this name, but I assure you that the cafeteria ladies had never had it. I distinctly remember my first "real" Asian food in my senior year in high school when I tasted mandu (Korean dumplings) at the home of my friend Alice. I had never tasted anything like it, and was blown away. I insisted on getting the recipe so I could share it with my mother. Then, during the summer break after my freshman year of college, I went to Long Island, NY, to have fun with friends and hit the beaches. Part of the fun included going to the theater to see the original Star Wars movie. We went out for "Szechuan" afterwards. "What's Szechuan?" I asked. My friends spun on their heels and glared at me as if I had just dropped in from Mars. I was, of course, blown away by the panoply of unfamiliar flavors. How was I to know this cuisine even existed? It was pretty much the same thing with Thai food just a few years later in Albany, NY, where I was busily starting my career as an orchestral musician. My friend Rich invited me to dinner. We were going to cook together and make a Thai dish he loved. I had no idea what that meant, but I was up for the adventure. Keep in mind that, by this point, I had already made a Gateau Saint-Honoré, baked my own bread, could french* a rack of lamb, and was pretty good at Oysters Rockefeller. Let's just say, I knew my way around the kitchen, but not all the way around the globe! I had yet to try Mexican, Ethiopian, Moroccan, Swedish, Syrian, Israeli, Brazilian or Indian cuisine. And, as it turns out, many of my favorite meals come from these countries. So, back to the Thai dish Rich planned to make. Was it really Thai? Thai-inspired? Not Thai at all? I really don't know. It did have a Thai curry paste and coconut milk. Was this, in the end, simply a better tasting version of the cafeteria ladies' chow mein? I guess what matters is how something tastes, and this dish tasted good. 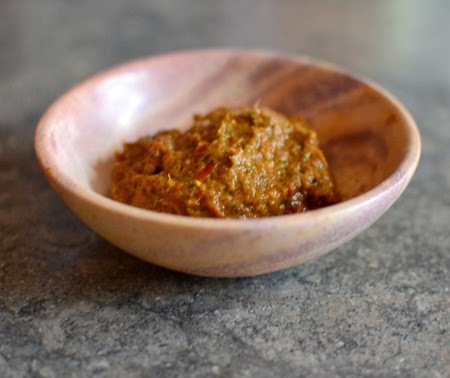 As an excuse to use chile peppers Mark grew in the garden this summer, I made my curry paste from scratch, but you will do as well to buy prepared curry paste. Making this brought back some nice memories of my early cooking and dining experiences. I will have to tag Rich on Facebook when I post this; I wonder if he will even remember making this for me. 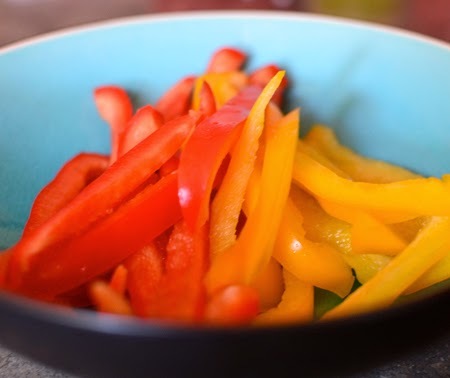 His original version had chunks of pineapple in it, which would still be good, but for this version I used some sliced red and yellow bell peppers to add some texture, color, and keep it more on the savory side. Start cooking the rice using conventional stovetop method or a rice cooker. While rice is cooking, heat combined oils in a wok or large skillet. Sauté cauliflower and onion till onion and cauliflower begin to turn golden. 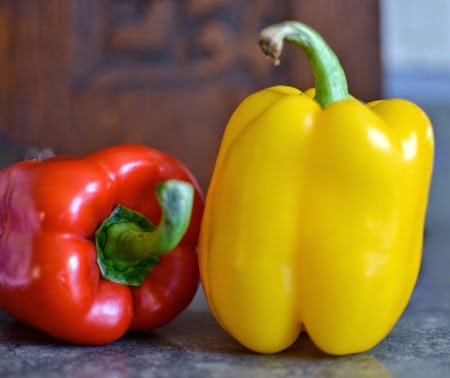 Add bell pepper slices and continue to sauté until onions and cauliflower are a bit darker. Mix the curry paste and coconut milk until smooth. Add to the wok/skillet and cook, partially covered, until vegetables are tender. It will be done about the same time the rice is finished. Spoon into large bowls with a side of rice. Sprinkle with cashew pieces and grated lime zest. Looks wonderful. Could I substitute Mexican limes? Sarah - yes, absolutely! You could even use lemon, if you wanted. It adds a nice bright note on this deeply-flavored dish. 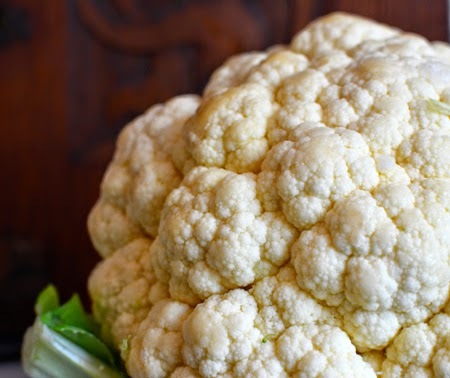 Cauliflower is one of our favorites - such an incredible vehicle for so many flavors. Glad you enjoyed this, Liz! You know, I still see much of that gelatinous slop you experienced at the school cafeteria in many food halls here in Australia. Sadly, to many non-Chinese, it was our introduction to the cuisine when we were young. I'm very grateful that my godmother took us out for lunch at a real Chinese restaurant, and trying a prawn toast or Peking duck for the first time blew my mind! 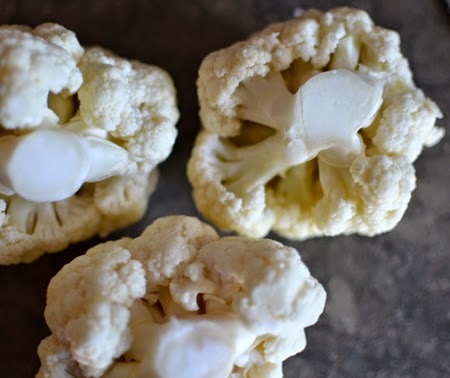 Did you use your chiltepins in this cauliflower curry? Wow - lucky you were to have a godmother whose duties went above and beyond to including culinary education. No, John - it would have take a billion chiltepins to make one bacth of curry paste! (You'll see!) I used Holland (Fresno) chiles to make the paste. We grew those, too. This looks fabulous, David! I’m such a veggie fan…if I didn’t crave a burger every once in awhile, I colud be a vegetarian! As always a great post! Kathy, I agree! If forced, I could be a vegetarian, but I love way too much in the food world! I don't want to limit myself. Hi David, just got back from Tucson a few hours ago from visiting my daughter, there are so many great places to eat. Love this post, had pad Thai in a place on Grant across from Bookmans. I pass that Thai place all the time, and hear it is really good. I have to get in there and try it! One of these days we need to meet when I am in Phoenix or you are here! Thanks for your note, Cheri! David, I was introduced to Thai food by my very best friend who now lives in Berlin. 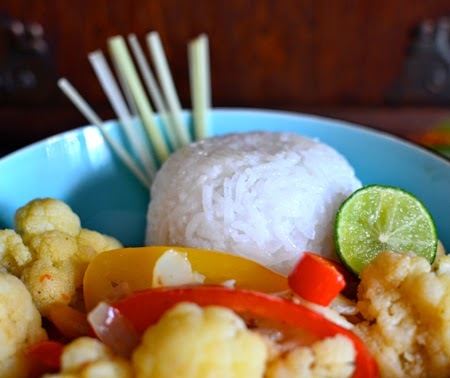 She had lived in Thailand for fifteen years and she is one of the best and most talented homecooks I know - I was hooked and I still am but as I told her on the phone last week - I never try to re-create her dishes at home, I think I never get them "right" - great post and delicious sounding recipe - travelling throug the cuisines of different countries is the best. Andrea - you are so right! I think I learn my love of other countries and their cultures after I have fallen for teir food. You shouldn't hae afraid to make these things at home - and I am sure your girls would love it! the more you exposed and stunned with ethnic food, trust me..
That is so true, Dedy - and your blog is proof! I love the quote. So very true -- with food, relationships, everything! 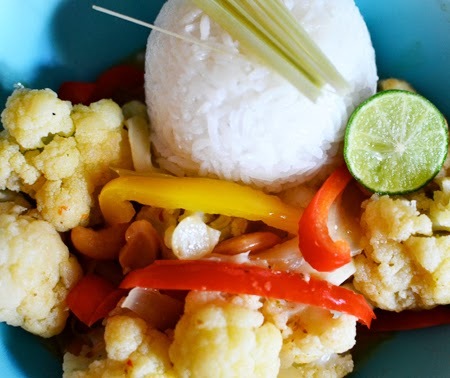 I adore red curry and must try this! 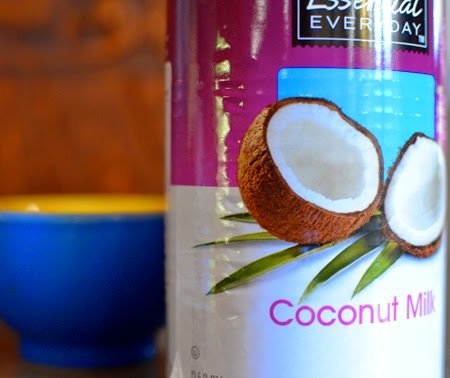 I find when curry paste is mixed into coconut milk, it's utterly divine! Hard to stop eating! Beautiful, David. Thanks, Valentina! Yes, the combination is perfect! Thanks, Rakesh and Swikruti - your words ring so true. I often think that the world should be run by cooks and people who love food - we learn so much about one another through our cuisine! I just think you're so worldly that it was fun to read this post. I grew up on Mexican food in SoCal and moved to Japan when I was 5 - back to SoCal, then off to Italy at 9. So, it's hard to imagine a more different upbringing than yours. But, you become a chef far younger than me. I always baked - mostly because my mom didn't. Lovely flavors in this dish! You had quite the upbringing, Susan - and you didn't even mention Italy! We certainly have had different paths to get us both where we are now! I'm still rather inadequate when it comes to Asian cooking. I have so much to learn! At least I didn't grow up on chicken jell-o though (ugh! That definitely shouldn't exist!). Love the look of this balanced, delicate curry. And he did. Maybe more than I did. I was born in NY and so I was quite accustomed to ethnic cuisines, yet many were not as readily available to try as they are now... I remember my first taste of sushi, Indian and Thai food very clearly. I sometimes watch my little kids handling chopsticks, asking for extra ginger with their sushi and choosing to go to 'the Sri Lankan' place they love for their birthday meals... and I see how much the world has changed. But there is a whole world of flavors out there still to discover and so much to still get excited about! I love that your kids are so open to all those different cuisines, Fiona. And you are so right - there is still a lot to get excited about! Discovering a new cuisine and finding out how much you love it is one of the most inspiring and satisfying things ever! 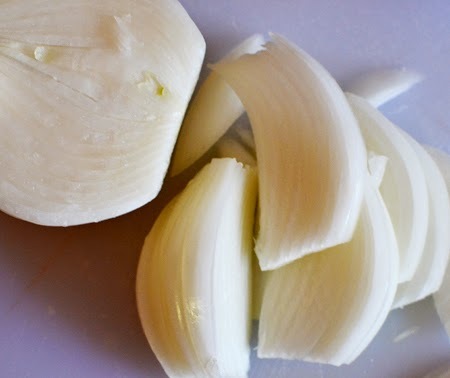 I loved reading this post, food memories are the best. I'm surprised your school cafeteria even served "Chinese" food! My lunch ladies were excellent cooks but they stuck with British classics, which I'm glad they did because that's where I learn to love British food. We ate Indian at home so at school it was nice to eat something different. I had forgotten that is how you found C&L, Nazneen - I am so glad you did, too! What a nice combination of cuisines to grow up with! The funny thing is that, even though it was truly disgusting, the chow mein is the only thing I ever remember eating in the school cafeteria. Go figure! 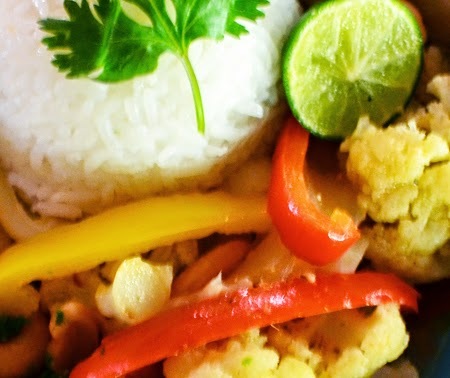 Glad you found Thai food - it is wonderful Did you see the article on why Indian cuisine is among the most popular in the world? Very cool from the scientific perspective. Thank you for sharing that recipe with us! I think what matters most is the taste of the food, whether you call it Thai food or Thai-inspired food. I see that you’ve got a great passion for cooking, and I hope you’ll cook and share more recipes in the future. Looking forward to trying them out in the future! Happy cooking! Thanks for visiting C&L, Nicholas, and for your nice comment! How good tastes is definitely important! I will look forward to visiting your bistro next time I am in Vancouver. 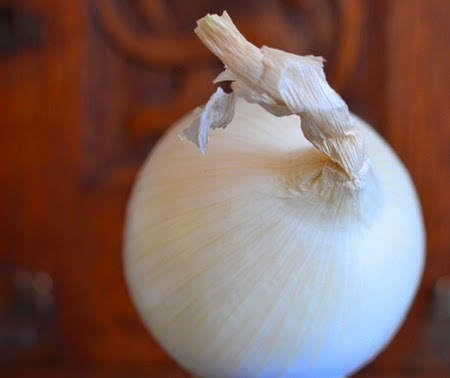 We are lucky to be living now, when almost anything we want is available in a grocer or online. I can only imagine how much easier my mother's life would have been, as she didn't drive. She could simply have ordered everything online! As you know, I loved this story. Oh, how we evolve! Even with the exceptionally strong foundation your mother provided in the kitchen, there was room for growth. I wonder what your mother would be cooking if she were still with us. Thanks for the terrific-sounding recipe and the lovely story. Although I was brought up with Italian and British cuisine, I too never tasted any other type of ethnic food such as Asian, until I was 12, when we met a Korean family and became very close. I had my first Thai meal in Hollywood when I was 22 and didn't touch it again until last year! Just goes to show you how one bad meal can have such an impact! 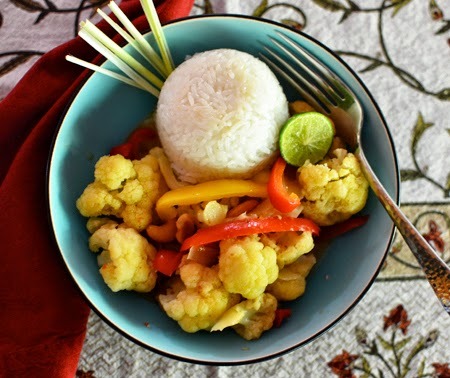 Your Thai dish sounds lovely (I know I'm terrible, but I'm not a big cauliflower girl, so I'd sub something for the main ingredient) but impressed that you made your own curry, too! This dish would be wonderful with broccoli, or even potatoes! 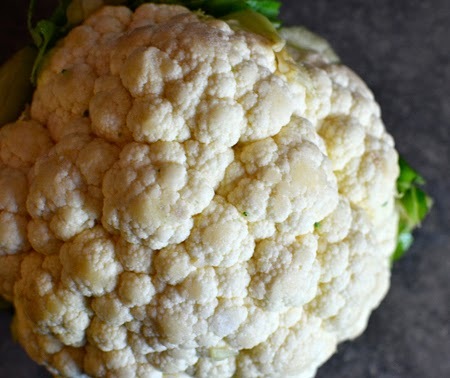 I am glad I love cauliflower, but I do know it is a tough vegetable for many.